A beautifully moving tale of loss and reaching out to the ones we love, of one man's journey to discover what really matters in modern life. Our narrator's days are numbered. Estranged from his family, living alone with only his cat Cabbage for company, he was unprepared for the doctor's diagnosis that he has only months to live. But before he can set about tackling his bucket list, the Devil appears with a special offer: in exchange for making one thing in the world disappear, he can have one extra day of life. And so begins a very bizarre week . . . Because how do you decide what makes life worth living? How do you separate out what you can do without from what you hold dear? In dealing with the Devil our narrator will take himself - and his beloved cat - to the brink. 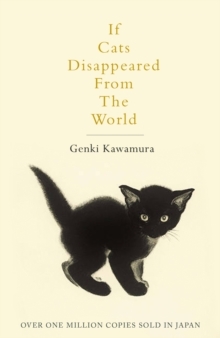 Genki Kawamura's If Cats Disappeared from the World is a story of loss and reconciliation, of one man's journey to discover what really matters in modern life. This beautiful tale is translated from the Japanese by Eric Selland, who also translated The Guest Cat by Takashi Hiraide. Fans of The Guest Cat and The Travelling Cat Chronicles will also surely love If Cats Disappeared from the World.